Department of Human Services (IDHS) director responds to reports. In the wake of an investigative-report series published by the Chicago Tribune that uncovered serious problems in some Illinois group homes for the developmentally disabled (DD) population, the General Assembly convened a joint committee to hold a hearing on the issue. More than 1,300 cases of abuse and neglect were uncovered by the series of news stories. Meeting on Tuesday, Dec. 13, the committee heard from agency Director James Dimas, who described work being done by him and his top aides to understand the size of the scandal and improve enforcement of living conditions in Illinois DD group homes. IDHS is required, under law, to supervise 3,000 licensed private-sector DD group homes throughout Illinois. These homes shelter approximately 12,000 persons with intellectual and developmental challenges, often in an extended-family setting. The treatment provided to persons in this category ranges from thoughtful, high-quality care to abuse and neglect. In some cases, DD group home caregivers are overwhelmed by the challenges of taking care of persons with two or more separately diagnosed disabilities. A major finding by the Tribune was that many of the cases of abuse and neglect that had taken place since July 2011 had been flagged in some way or another by IDHS oversight, but that many of the investigative files on these cases had been hidden, concealed, or even legally sealed. A key pledge made by Director Dimas this week was that the Department will create a new infrastructure of electronic transparency to increase access to information on the standing of each group home. The transparency infrastructure will include an Internet-based public report card to detail the status of many State investigations based upon allegations of abuse and neglect. The report cards will include evaluations of many Illinois DD group homes. In another pledge, Director Dimas stated that Illinois group homes for adults with disabilities will face stricter standards for establishing and maintaining licensure. As year-end deadline approaches, talks are suspended. Many facets of state spending are moving towards limbo with the approach of New Year’s Eve. Dec. 31 is the expiration date for the so-called “stopgap budget” that is authorizing much of the State’s spending activities during the final two quarters of calendar year 2016. The “stopgap budget,” which was enacted in summer 2016, was meant to serve as a bridge to cover the first half of the 2017 fiscal year while budget negotiations took place. However, high-level budget talks have been suspended. Governor Bruce Rauner stated on Wednesday, Dec. 14, that based on his face-to-face contacts with leading Democrats, negotiations are not being productive at this time. Under the complex current Illinois budget situation, not all areas of State spending are tied to the so-called “stopgap budget.” Significant FY17 spending programs, such as Medicaid and pay for state employees, are tied to court orders, consent decrees, and continuing appropriations. Other spending programs are being carried out through Dec. 31 in line with the so-called stopgap budget. Still other areas are not covered by any current appropriation at all, and monies for these programs are not being spent. Many entities that are not receiving needed state funding, such as community colleges and offices that carry out many social programs, are begging for relief. The estimated retail sales by the nation’s department stores (including leased departments) in December 2015. A decrease of $0.4 billion in retail sales from December of the previous year. The estimated percentage of total 2015 sales for department stores (including leased departments) in December. For bookstores, the estimated percentage was 12.4 percent. The estimated increase in the end-of-month inventories by our nation’s department stores (excluding leased departments) between August and November 2015. The estimated value of retail sales by electronic shopping and mail-order houses in December 2015 — the highest estimated total for any month last year. The fourth quarter 2015 after-tax profits for all retail trade corporations with assets of $50.0 million and over, up from $18.3 billion in the third quarter of 2015. The value of U.S. imports of Christmas tree ornaments from China between January and September 2016. 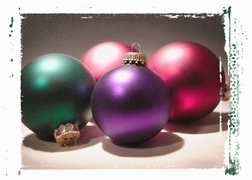 Imports from China led the way with 92.0 percent of the total imports of Christmas tree ornaments. The value of U.S. imports of Christmas tree lights from China between January and September 2016. 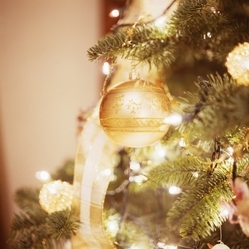 Christmas tree lights imported from China accounted for 87.0 percent of the total imports for that product. 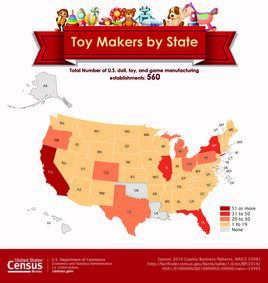 The number of locations nationwide that primarily produced dolls, toys and games in 2014, an increase of 15 locations from 2013 (545); they employed 6,215 workers in the pay period including March 12, a decrease of 323 employees from 2013 (6,538). California led the nation with 93 establishments. Some names of places associated with the holiday season consist of a dozen places named Holly, including Mount Holly, N.C. (population 14,176), and Holly Springs, Miss. (7,610). There is Snowflake, Ariz. (5,666); Santa Claus, Ind. (2,474); North Pole, Alaska (2,189); Noel, Mo. (1,824); and — if you know about reindeer — Dasher, Ga. (963), and Rudolph, Wis. (432). There is also Unity, N.H. (1,603), and Peace, N.D. (28). The estimated number of young domestic turkeys hatched during September of this year in the United States, up 21.0 percent from September 2015. The value of U.S. imports of tapered candles in 2015. Most of these came from Vietnam, representing more than 35.0 percent of America’s imported tapered candles, followed by Canada with 24.0 percent. Many of these candles are lit during Diwali (Nov. 11), Hanukkah (Dec. 6-14) and Kwanzaa (Dec. 26-Jan. 1) celebrations. Eleven residents will be vying for a total of seven seats on the Fox Valley Park District Board of Commissioners in the April 4 elections. They will be the first candidates on the ballot in the Park District’s 70-year existence. Since its formation in 1947, state law called for Park Board members to be appointed by the Kane County Board chairman, as opposed to being elected, as most other park boards are throughout the state. As the second largest Park District in Illinois, Fox Valley serves 233,000 residents in Aurora, North Aurora and Montgomery, covering four counties – Kane, DuPage, Kendall and Will – encompassing 65 square miles. The new state law, through legislation sponsored by retired Kane County Board chairman Karen McConnaughay, creates three geographic districts, with two elected from each district. A seventh member is elected at-large. The 1st District includes the entire west side of the Fox River, from the North Aurora village limits on the north to the Montgomery limits in Kendall County to the south. Its western limit is the city limits for North Aurora, Aurora and Montgomery, and the eastern limit is the Fox River. The 2nd District has a western limit of the Fox River, running south to the Kendall County line, running east to the DuPage-Kane county line, north to the railroad tracks, west to Farnsworth, north to Indian Trail and west on Indian Trail to the river. The 3rd District runs from the North Aurora village limits and the Aurora city limits on the north to the Aurora city limits in Will County to the south. The eastern edge runs to the Aurora city limits on the east, in DuPage County, at some points going as far as Route 59. Its western limit is the Fox River running south to Indian Trail, where it turns west along Indian Trail to Farnsworth Ave., south to the Burlington Northern Santa Fe Railroad tracks, east to the DuPage-Kane County line, running along the boundary with the 2nd District. 1st District: Charles Anderson, Aurora; Matt Hicks, Jr., Aurora. 2nd District: LuAnne Kelsey, Montgomery; Elizabeth “Beth” Waller, Montgomery; Jerry Butler, Aurora; Mary Ann Cummings, Aurora. 3rd District: Giovanni Santana, Aurora; Holly Scholz, Aurora; Roger Schnorr, Aurora; Cynthia G. Penne, Aurora. The elected Board will be seated on May 1, 2017, at which time a lottery drawing will take place to determine length of terms, which will be staggered. Initially, four Board members will serve four-year terms, and three Board members will serve two-year terms. Families and children can start their New Year’s Eve activities early with a celebration from 11 a.m. to 1 p.m. on Saturday, Dec. 31, at the Vaughan Athletic Center. The Family New Year’s Eve Party will ring in 2017 with a variety of festivities. Kids and adults can get energetic while climbing and bouncing on giant inflatables, playing interactive games, competing in hula hoop contests and dancing to the latest tunes with a live DJ. Popular features also include the “Active Toddler Zone,” a “Meet-and-Greet” with favorite characters including Spider-Man, Tinkerbell, Storm Trooper, Elsa, Cinderella and others and the traditional New Year’s countdown featuring a colossal balloon drop at noon. Guests are encouraged to pre-register by noon on Dec. 30 to guarantee admission, party favors, activities and snack. Advance tickets are $8 per person (ages 2 and up) and available online. Children under 2 are free. Day-of registration is $11 per person, but the event often sells out; party favors and snacks are not guaranteed for those who register on event day. For more information, call the Vaughan Athletic Center at 630-907-9600 and follow updates on the Vaughan Center’s Facebook page. Wednesday, Jan. 11, 2017, 8:00 – 9:30 a.m.
• GenTax-an accessible snapshot perspective of what they are required to pay. • SIDES-Sides is a free system for protesting unemployment insurance claims and submitting Notices of Claims electronically. Fast, secure and efficient. • Fighting Fraud-our OATS program. • Getting job seekers back to work…resume requirements etc. Exciting changes ahead which will ultimately benefit the employers in our State. Thursday, Jan. 12, 2017, 7:00 – 8:30 p.m. Presented in collaboration by the Aurora Regional Chamber of Commerce, Aurora Public Library, Fox Valley PAC, Quad County African American Chamber of Commerce and the Aurora Regional Hispanic Chamber of Commerce. Your participation matters! If you are not already registered to vote or if you need to update your information on file with your voter registration, this is a great time to do so. Visit AuroraProsperity.org for deadlines, information, and polling locations. Tuesday, January 17, 2017, 8:30 a.m. This event provides business connections, an introduction to key leaders in the Chamber, upcoming chamber events and an opportunity to learn how you can maximize Your Chamber Membership. January is sponsored by Eye Boutique. Thursday, January 26, 2017, 8:00-9:30 a.m.
Start 2017 making great connections! Get your introduction ready! Aurora Regional Chamber of Commerce Fox Valley Networking Professionals is an open networking group that creates a positive atmosphere of collaboration, connection, introduction, business education and more. All attendees will introduce themselves, share business cards and have open networking time before breakfast is served. Pre-registration is highly recommended. Breakfast included with registration. Wednesday, January 25, 2017, 11:30 a.m.
On Wednesday, January 25, the Aurora Regional Chamber will reveal the results of the 2017 Aurora Regional Economic Pulse Survey. The survey link has been shared with local businesses. In partnership with our sponsors – Old Second Bank, Invest Aurora, and Dolan & Murphy – and community supporters, the results will be used to provide a stronger support system for business owners, entrepreneurs, and employers in the great Aurora region. Wednesday, Jan. 11, 8:00 a.m.
Tuesday, Jan 17, 8:30 a.m.
Did you know you updating your representatives and their contact info from your business in your profile page is vital to ensure all your representatives are receiving Chamber communications? Please take a quick look to ensure everyone is getting our updates. If you have any questions about your login, please contact Reba Osborne, director of membership, at (630) 256-3184. Holiday Assistance Program Begins; Can You Assist? Pressure for a budget deal is being driven by the deteriorating financial condition of the State. The Comptroller’s office indicated that Illinois had, as of Tuesday, December 6, piled up a backlog of unpaid bills totaling more than $10.6 billion. These include both bills that are actually in the Comptroller’s office awaiting payment and bills that are in the various State agencies and have not yet been forwarded to the Comptroller. COGFA report shows Illinois earns mixed scores on various economic variables. The report from the Commission on Government Forecasting and Accountability (COGFA), “Illinois’ National Rankings – 2016”, was released on Thursday, December 8. The December report looks at a variety of nonpartisan and nongovernmental measuring sticks that are used to gauge Illinois’ tax rates, tax revenues, government spending, employment trends, and business climate when compared with other U.S. states. To summarize, the COGFA report confirms data from a wide variety of other sources. It draws a picture of extremely slow, underperforming job growth in Illinois relative to other states. As of October 2016, Illinois stands 43rd among the 50 states in terms of unemployment rates (5.6% as opposed to the national rate of 4.9%). This slow job growth, which has left Illinois with fewer nonfarm payroll jobs than were supported by Illinois employers sixteen years ago in 2000, has encouraged young Illinois residents to consider leaving the Land of Lincoln in search of better opportunities elsewhere. Illinois is 39th among the 50 states in terms of its job recovery/job growth following the so-called “dot.com” boom of the late 1990s. Our state ranks poorly (relative to other U.S. states) in terms of new jobs created over the past year, five-year period, ten-year period, and twenty-year period. Major changes in Illinois policy will be necessary to counter this trend. Unfortunately, the report does not suggest easy or obvious answers to this policy dilemma. In particular, a picture of Illinois as a golden state for wasteful taxing and spending is muddied by this report. In 2015, Illinois extracted 6.2% of its residents’ $636.3 billion in personal income from their pockets in the form of more than $39.5 billion in state taxes, marking Illinois 24th in the nation in terms of state government tax revenue as a percentage of state personal income – close to the middle of the 50 states. Illinois’ reality as a high-tax state is closely tied to our exceptionally burdensome structure of local “home rule” and property taxes. These local levies are charged and collected by local governments and school districts, not the State of Illinois. This indicates that necessary policy changes will have to include actions affecting all facets of government here in Illinois. The Commission on Government Forecasting and Accountability (COGFA) is the nonpartisan budget watchdog office of the General Assembly. It monitors data points and trends, including economic variables, to guide the State Legislature in its budget and policy decisions. Illinois House posts schedule for 2017 spring session. The newly-elected and re-elected members of the Illinois House will convene in Springfield on Wednesday, January 11, to take the oath of office. House Speaker Michael Madigan’s office has posted a session calendar for the House to follow when its members introduce new bills next spring and debate them in committee and on the floor. The House will also consider bills sent over from the state Senate. The spring session is scheduled to end on Wednesday, May 31. In addition to the session work of the new 100th General Assembly, the 99th General Assembly may well have a few last things to do in January. Two “lame duck” session days have been posted on the schedule for Monday, January 9, and Tuesday, January 10. It is not yet known for what purposes these days will be used. Avery Bourne (95th District, south-central Illinois). Representative Bourne is a law student and a specialist in issues of agriculture and rural law enforcement. She serves on Illinois House committees that deal with issues involving agriculture, consumers, counties, transportation, vehicle safety, and veterans. Tim Butler (87th District, Springfield area). Representative Butler is an experienced hand at constituent issues from his services as district chief of staff to two members of the U.S. Congress. He serves on House committees that deal with issues involving the environment, tourism, roads, and vehicle safety. David Olsen (81st District, central DuPage County). Representative Olsen is a skilled professional in financial investing and trading. He serves on House committees that deal with issues involving community colleges, schools, criminal law, public utilities, and renewable energy. David Welter (75th District, northeastern Illinois). Representative Welter is the former chairman of the Grundy County Board. He serves on House committees that deal with issues involving agriculture, appropriations/public safety, schools, charter schools, energy, criminal law, restorative justice, and special needs services. Sara Wojcicki Jimenez (99th District, Springfield area). Representative Wojcicki Jimenez is a former journalist and Statehouse spokesperson. She serves on House committees that deal with issues involving agriculture, State universities, business and occupational licenses, economic development, and international trade and commerce. In addition to these five now-experienced new members with committee assignments, ten completely new House Republican members – representing districts from McHenry County on the Wisconsin border to Williamson County in far southern Illinois – will ”hit the ground running” over the next few weeks as they celebrate their election to the Illinois House of Representatives. You are currently browsing the Aurora Regional Chamber of Commerce blog archives for December, 2016.